This is an ad for Tivoli Casino, but they do not have any influence on the review. Tivoli Casino was launched in 2012 and is owned by the well-known Tivoli Group. At Tivoli Casino there are many possibilities in terms of game range, where it is possible to play the classic casino games like roulette, blackjack, poker and also the popular slot machines. Many of these games can also be played without making a deposit, thereby ensuring you have fun even without worrying about the costs. It allows players to try out new slot machines and evaluate whether they want to play them for real money. Tivoli Casino is approved by the Danish gaming authorities and has a Danish casino license. The casino is monitored by the Ministry of Taxation, which provides security for Danish players and terms that ensure payment, security and responsible gaming in general. Tivoli Casino offers an extensive range of available games. They have a nice combination of in-house slot machines and popular games from the world’s most well-reputed developers. The opportunity to play just for fun without making a deposit, is also a major perk. 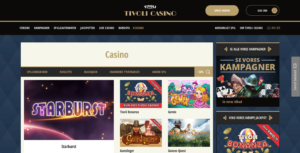 Tivoli Casino offers a nice welcome bonus that matches your first deposit with 100% up to 3,500 kr. In addition to this, you get 25 free pins for the Tivoli Bonanza slot machine and 100 free spins for the Sweet27 Slot Machine. Tivoli Casino offers both classics like poker, blackjack and roulette, but also a wide range of slot machines. The software is from reputable game producers like NetEnt, Microgaming and Play’n’Go etc. This ensures that the gaming experience is smooth and without any glitches or technical errors. Despite running the most sophisticated software, there can be the rare chance that problems might occur. In such a scenario, Tivoli Casino is well-prepared to address your concerns and sort out your issue. You can communicate with the customer support agents using email, live chat or through the contact form.